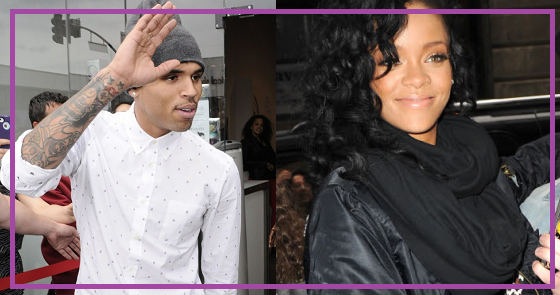 Well, it looks as though Chris & Rihanna are at odds again. 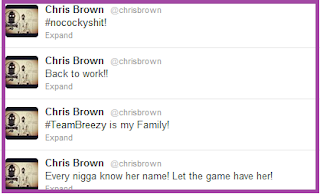 Unfortunately it's not the easiest thing for Chrianna fans to watch unfold. Yes there are die hard "Chrianna" fans.. all fans for different reasons and they even have a website dedicated to the relationship and the two separately.. wow right? 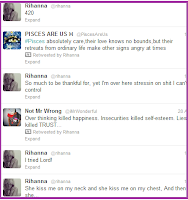 Last night their saga continued as Rihanna basically tweeted out that she had tried her best to rekindle the relationship and that it is causing her lots of stress. Chris' rebuttal, which came immediately after, was basically that Rihanna was getting around so he was over it. When Rihanna tweeted "I tried Lord!" my heart sunk into my stomach for a few reasons. Now I caught a LOAD of flack from people on twitter for my rant on forgiveness stemming from Chrianna's releases of Birthday Cake & Turn up the Music. I wont go into that, but I will be honest and say that I know first hand what it's like to be in that place. To love someone with everything you have and to try try and try more to make it work against all odds because you're sure it's meant to be. As the legendary Donny Hathaway put it.. "Giving up is HARD to do!" Its almost impossible to do actually. Especially when you feel like you're whats best for an individual. The giving up means you're risking your happiness but more importantly you're risking theirs too. 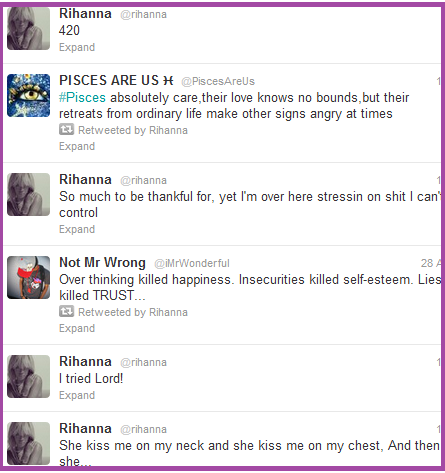 I took a peek at Rihanna's favorites last night and they echoed the few tweets she sent out. Fans began to worry on twitter and send her encouraging words to boost her mood. They were given some hope that their fave was ok as photos of her arriving back at her hotel from shooting her SNL promo (below) depicted a smiling Rihanna. Some worried though that it was all a front. I mean to read some of their replies was sad... these fans really seem to care about Rihanna and Chris' over all happiness. To the Chrianna fans losing it over this most recent twitter feud - when two people have experienced the highest of highs and lowest of lows together.. anything in between is easy to face. What I mean by that is a dispute amongst your fave couple (especially this couple) does not mean the end. They've bounced back from one of the most tragic and public conflicts ever and became friends again.. whats a mere dispute over photos/ gonna do? I don't personally care who either of them end up with, but I did feel Rih's heart last night as I observed her twitter. Overall if all of this is really going down as speculated..Chris has some major reevaluating to consider. Im trying to figure out how Karrueche cant seem to get a reaction from him on twitter (even when she tweets congratulatory/sweet things directly to him), but Rihanna can......? Why does it matter WHATEVER Rihanna does? She's a single woman and Chris' committment is supposed to be elsewhere. hmm..
We'll see how this manages to unfold in days to come.. tomorrow is Chris' bday... Rihanna is set to be on SNL.. fans are hoping she wishes him happy bday as he did her in March.... after last night... whoooo knows. Yes we love both of them equally and we want them to be together. This aint speculation, its very obvious that they love each other and we want them to know they have support from fans! I like your blog!